We are gathered here today to celebrate the first edition of a book, we, the “followers” and friends of Carles Compañ (or Company for those without an Ñ on their keyboards) have been waiting for. The book is a literal transcription of an entire workshop that took place last year near the Veracruz port. In addition to Carles, fifteen other people participated of the workshop. Why would a book like this be interesting to read? A book that talks about strangers and their personal experiences? In order to answer this question, let us begin describing at large what a workshop like the one referred to in this book is about. We always go outside the city, to a quiet place surrounded by nature and we live there during five days in a residential type of seminar. We begin the day with a short meditation that Carles calls “settling or arrival” in which we remain still and silent during twenty minutes more or less. This settling prepares the body and the mind for what Carles begins to talk about after the meditation. I would not want to call it information since it’s not like other seminars that teach technicalities, anatomy, physiology or embryology. It is more about a personal view. We will talk about this personal view soon. We talk and ask questions regarding what Carles shared and later we move onto the massage tables so our bodies can assimilate all that “information”, this worldview that we were offered. Half the group lies on the massage tables and the other half plays the role of therapist. After the meal break we “settle in” again and those who played as “patient” switch to become therapists. The experiences of being patient and therapists are shared in circle. This dynamic is repeated during the five days. To be on the massage table as a patient or therapist is just as important as the theory spoken about since it is of no use to talk or read dozens of books regarding how to change and how to be more coherent with our selves if all that information remains at the mind level. Carles rightly insists that all that information has to be embodied and the way to do it is through the sessions of biodynamic presence. What is this perspective Carles shares with us about? Well, it is hard to sum up in just a few words, but it is the most substantial part of the book because it has to do with a wide and deep vision about the way human beings are and act in this society; how we are educated, how as babies we perceive in a different way, without separation, and, how little by little we are installed like “software applications”programming us into separation. This is the root of many of our problems today. In this way we begin to not sense or feel our bodies, to not accept our complex and sometimes very hard experiences; to not own responsibility for our own decisions and circumstances; to blame others, our parents, children, partners, our government and even God; we believe our life stories: our names, gender, profession or our bodies and nothing else; we learn to resist pain creating suffering which are not the same. Pain is inevitable; it is part of this world. Suffering is our resistance to the pain. Carles explains how the mind, our thinking, attaches itself to the known and fears the unknown, death, Being, the Emptiness, the Stillness when this is truly what we are. We could spend a good while mentioning all the topics touched during this kind of workshops. Although it may be much better for the person to pick up a book and read it at his/her own pace going over those parts that are most interesting or most challenging. Without a doubt Carles’ views could be very challenging at times. The book contains many assertions that are not only opposite to our common beliefs we are also strongly identified with them. So when we hear some of them for the first time they probably are very disturbing when not point blank shocking. Like “hope is a way of escaping the present moment; a way of postponing the right action”, or “no one has control over anything” things (life) just occur; or “knowledge is limiting, therefore, to know is death”; another: “bless uncertainty since expansion, the normal movement of life, can only emerge from this place of the unknown”; or “it is not the chaos outside responsible for the chaos inside but just the other way around”. It is the chaos and our lack of consciousness that is reflected in our societies and the reason society looks like madness. Carles also says no one is ever to blame: not us or the outside since we all act the best we can because, and here maybe the least evident assertions of all: Carles affirms that “absolutely everything is within ourselves; there is no other”. The way Carles views and presents the Biodynamic Presence can be a therapeutic option and at the same time it may not. If, for “therapy”, we understand seeingsomeone, a doctor, a psychotherapist or any other professional so that he/she can remove our suffering or free us from an experience that is bothersome, uncomfortable, painful or unbearable, then biodynamic presence is not a therapy. On the other hand, if we understand therapy as a tool that instead of seeking to remove the pain or what is making us suffer, helps us to realize that whatever is happening is an important message from our body, that it is the way our body andspiritual intelligence has to express itself; if, this tool invites us to be with the pain, to listen to it, to comprehend it openly and profoundly instead of resisting it, or fight it, then biodynamic presence is a therapy with which we can free and transcend our pains. There are countless types of therapies nowadays, many of them very valuable. Some are more invasive or efferent as they are called in the medical jargon, in other words, these manipulate from inside or from outside physically, chemically or psychologically to remove symptoms or correct anomalies. And, there are other more subtle treatments that are based on the body inherent healing resources. Personally, I believe that to have so many options is something to be grateful about. However, I dare say that biodynamic presence goes beyond a therapy. The work, as Carles calls it, is very subtle and it transcends its therapeutic origins because it can be taken to our daily lives. It can be practiced as a way to be in life, for personal growth and above all as a way to know one self. 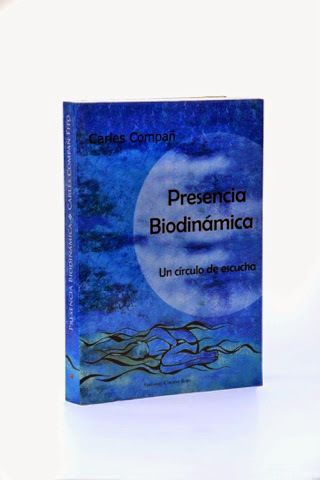 Carles named the work Biodynamic Presence and now will try to explain why. The word Biodynamic invites us to recognize or it reminds us that life is dynamic, that is to say, that it is in constant movement, an unceasing and uninterrupted flow, a constant change, a coming and going like the tide that takes us here to there from one situation to the next. Sometimes we like those situations so much that we grow attached to them, we identify with them or we want them to last for ever, in this way we stop flowing with life; we begin to resist the change, the natural movement of life. This closes and limits us and finally we get stuck and are not able to expand energetically, if I am permitted to express it like this. Contrary, when the new situation that emerges is “ugly” or painful or not likeable to us we resist it, we condone it, victimize ourselves, we fight with it and it may seem the opposite of when we like the situation but in reality we are doing the same thing: we stop moving with life as it is, we get trapped, contracted, rigid and again we stop expanding. We are caught in the cycle of pleasure and suffering. On the other hand, the word Presence implies a constant contact with one self in the present moment, here and now; a constant being in the body and feeling everything that goes thru it (essentially everything, right? Not only the information referred by our senses, sensation, perception, pain, but also our emotions and even our thoughts). The basis of the biodynamic presence is what Carles calls a profound listening which is what we were talking about earlier: the possibility to completely open up to what is taking place now, without judgment, evaluation, without labeling it nor anticipating it; it is a resignation to what we know including what we think the other person is going through or needs. When we learn to be free with what is taking place in us, for instance, when little by little we observe without identifying with our mechanisms and aversions, our feelings of inadequacy, envy, jealousy, but without these loaded words, then we are fully listening. A person able to fully listen to her self is then able to listen to others. When, someone not able to listen is in front of a person who can then that first person is able to listen to his or her self and begins to heal. There is a therapeutic slogan that says: “to be fully listened to is to be fully healed”. No statement is truer when it comes to Biodynamic Presence. The work Carles invites us to, BP, and the reason he calls it that, is because it is about learning to totally open up to life and to flow with it, recognizing with our bodies, little by little, our repetitive patterns (born out of our life stories) that make us react more or less violently to what we don’t like and also react attaching us to what we are identified with, in either case, stopping the natural expansion. Like this, BP becomes a tool to open and observe the totality of existence, a way that would certainly transform the world into a harmonious and better place. Lastly, we should say that this “work” is peculiar in that it cannot hold a pre-conceived goal be it physical or spiritual. Of course, if we take a session we will expect some change but what is essential is a gradual movement into a state of body consciousness, where we can say, our internal processes or recurrent patterns, typically buried in our unconsciousness, are “displayed”. Also, important to say is that the work could or not pass thru the analytical level of the mind or thought. What is essential is that it reaches the profound level of a lucid consciousness, aware and free of judgment where it is understood at its root.